Few places on earth cause as much amazement as the Riviera Maya. What makes the Riviera Maya so different from other coastlines around the world is that the Riviera Maya is full of magic, a place where you can completely escape from the outside world. It is filled with natural wonders: ecological reserves, the emerald–green jungle, the incomparable turquoise blue sea and countless lost cities of the ancient Mayan civilization. Lying hidden amidst the intense green is a habitat with a rich variety of flora and fauna and geological formations that is impossible to find anywhere else in the world. It is also renowned for its cenotes, sweet–water deposits of capricious shapes and different sizes, produced by the subterranean rivers which emerged to the surface over the course of millions of years. Facing the Riviera Maya's coast is the world's largest coral reef in the northern hemisphere, making it the perfect place for scuba diving and snorkeling. Hundreds of marine species, including multi–colored tropical fishes, sponges, starfishes and various types of coral make up the spectacular and fragile great maya reef. It just doesn't get any better than this! Explore the mystery of Mayan caves in Aktun Chen. Stroll along 'La Quinta Avenida' of Playa del Carmen and enjoy the wide variety of bars, restaurants and shops. 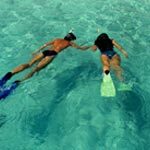 Discover the underwater world at the largest coral reef on the northern hemisphere…Snorkeling and Diving. Get in touch whit one of the greatest biodiversities in the world on the Biosphere Reserve of Sian Ka'an. Relax and experience a Mayan treatment in one of the multiples Spa's in Riviera Maya.